The new development will also include a new Cargo Terminal, which will create more space for ferry traffic at the Eastern Dock. One of the main features of the redevelopment is the creation of a new marina, a haven for yachts that extends out into the main harbour area behind a new public access pier. Prior to the redevelopment, pleasure craft were accommodated in the Wellington Dock, a sheltered basin behind the sea wall, accessed via the inner harbour. Marine access to Wellington Dock will now be provided from the new marina via a 120m-long navigation channel through the narrow neck of land with a pair of lock gates to isolate the dock from the tidal marina and outer harbour. Road and pedestrian access the Wellington Dock Navigation Channel will be provided by a 15m-span lifting bascule bridge. 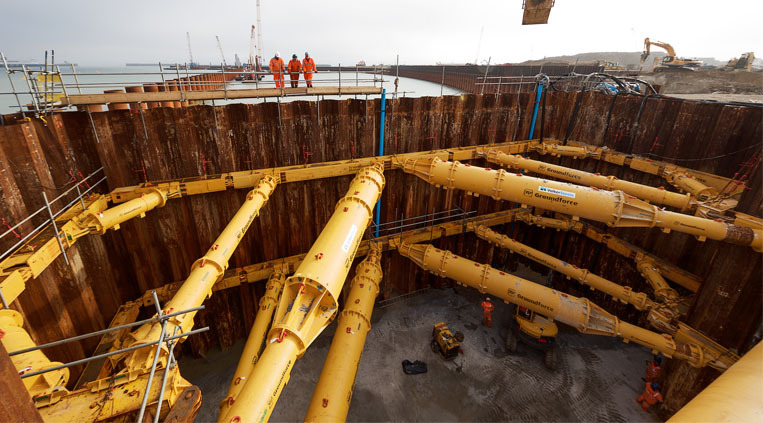 To create the navigation channel, VSBW – a joint venture of Volker Stevin and Boskalis Westminster, had to demolish part of the 19th century harbour wall and install a sheet pile cofferdam prior to excavation commencing and the reinforced concrete walls and the base slab cast. A major feature of the 18m deep, 20m wide excavation is the extensive structural support required. Groundforce was brought in to provide its hydraulic waling beams and props to shore up the sheet-piled walls of the excavation which was subject to high and very variable loads. “The navigation channel is a fundamental part of the marine and structures package for this project,” says Patrick Leahy, VolkerStevin’s site agent responsible for the piling works. “And as a marine excavation, this part was complicated by poor ground and groundwater problems,” he adds. Despite the high chalk cliffs rising up behind the port, the ground in which VSBW was working was loose sand and gravel. Twenty-metre-long steel sheet piles were driven 6m below formation level and two levels of hydraulic props were installed sequentially as the excavation progressed. Total dig depth was around 15 m.
Originally there were going to be two phases – Phase 1 comprising the inner section, extending from the Wellington Dock to roughly half-way, and Phase 2 starting within the coffer dam installed in the new marina and progressing inland towards the complete first phase. In the end, it was decided to complete Phase 2 in two sections due to programme opportunities. “If we’d opened Phase 2 out in its entirety it would have restricted movements around the site, so we started Phase 2 at the seaward end and then completed the cut with the central section,” explains Mark Whitmore, major projects director with Groundforce. Groundforce provided its hydraulic Mega Brace, a modular frame that is adjusted and pressurised with integral rams, to provide the waling beam along the line of sheet piles. The waling beam supporting the Phase 1 excavation was propped with MP150 tubular props spanning the excavation from side to side. These props each has a maximum load capacity of 150 tonnes; two additional MP250s (250 tonne capacity) were placed as raking props against the end wall to support the load from the Phase 2 ground. Phase 2a – the seaward section of the cut – was the next section to be excavated. Because this section adjoins the new marina it is therefore exposed to the full effects of the 7m tidal range of the outer harbour and hence subject to high and very variable loadings. Here, VolkerStevin employed Groundforce’s biggest frames and props to cope with the pressures exerted by the rising tides. The Super-Mega brace is the strongest proprietary hydraulic brace available. Modular sections ranging from 3m to 12m in length were combined with a hydraulic unit designed to give 1.5m of fine adjustment within the largest excavations. The high load capacity of the Super Mega brace allows clear spans in excess of 21m. Groundforce fabricated bespoke reverse jointing brackets to connect sections of the waling beam where the excavation widened to facilitate the new mechanical sector gates (lock gates). All the props used in the Phase 2a excavation were 250 tonne capacity MP250s, the longer props employing 1.22m diameter ‘super tubes’ for added rigidity. Phase 2b – the central section of the cut, also used the Super Mega brace with a mixture of MP150, MP250 and one MP500 (at 500 tonnes capacity, the largest prop of its kind currently available) to support the sides. “Using more hydraulic props, in conjunction with a smaller brace, could have provided a rigid enough structure to support the excavation”, says Whitmore “but that was not an ideal solution. The Super Mega brace needs fewer props and we needed to keep the prop spacing as wide as possible to provide space for VolkerStevin to work in the excavation,” he explains. “As the sheet piles need to be propped all the time. We removed props due to load changes as the concrete works progressed. The smaller MP250s in Phase 2b were swapped for an MP150 once the upper level of 2a was removed,” he adds. Dividing the excavation into three phases complicated the temporary works, which required temporary sheet piled partitions to separate the three excavations. However, the biggest challenge was the landward pressure of the rising and falling tides. Consulting geotechnical design engineer Tony Gee & Partners calculated the loadings and provided Groundforce with the specification. While Groundforce routinely provides a design service as part of the hire contract, on this project it was required to undertake its own temporary works design under separate contracts. Consequently, Groundforce signed three separate short-form NEC design subcontracts, one for each phase of the works, in addition to its main £600,000 hire contract. Work on the navigation channel began in spring 2017, with the first hydraulic supports delivered in September. The base of the navigation channel comprised mass concrete, to a depth of almost (0.5m), with a reinforced concrete base slab (1.8m) and retaining walls above. Reinforcement was complicated around the sector and mitre gates, the corners of the base are chamfered, which also required a lot of space beneath the props. Once the base was in, however, the lower frame could be removed. The VSBW joint venture is due to complete all the marine civil engineering work by the end of 2018.